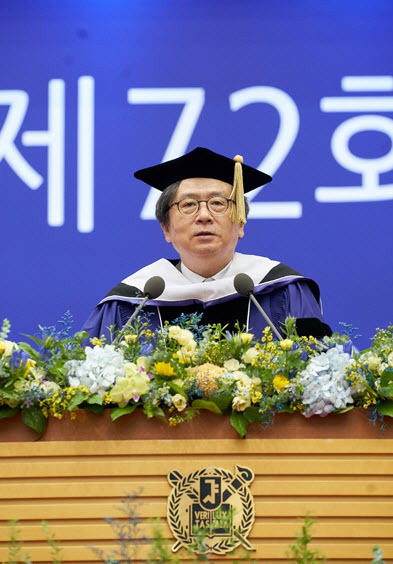 On August 29, SNU held its 72nd summer commencement for approximately 2,500 undergraduate and graduate students at the Gwanak Campus Gymnasium. Distinguished Professor Kim Hodong (Department of Asian History) gave the congratulatory speech on behalf of the faculty. While Professor Kim humbly doubted his own ability to address a generation that is facing change on an unprecedented pace and scale, his words expressed a wisdom that is timeless, highlighting indelible values and the rewards of the human endeavor. Professor Kim said that one of the greatest rewards of the individual pursuit is mastery, which in turn benefits society. Professor Kim encouraged the graduating class to devote their talents and efforts for the betterment of not only themselves but also society, saying that one day they could become the “great stone faces”—human monuments of greatness—of their generation. Professor Kim ended his speech citing the Bible, “I have fought the good fight, I have finished the race, I have kept the faith,” offering final words of inspiration and solace to a class entering the next stage of their lives.